Wardrobe Rescue was founded in 2011 to bring new and like-new consigned fashion to Northern Virginia. We pride ourselves on our community and small business. Come in and take a look! 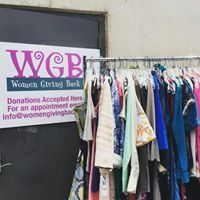 Our unsold merchandise is donated to Women Giving Back, a local non-profit organization dedicated to supporting women and children in crisis, and build their confidence and self-esteem, by providing great quality clothing at no cost.